It’s officially the holiday season, which means lots of planning, shopping, gifts, and parties. Over the new few weeks, I will be giving you advice on how to stay healthy, gift picks and much more. This week, I want to highlight the popular premium fitness and sleep tracker, MisFit Ray by Fossil. I couldn’t contain my excitement about receiving the MisFit Ray Rose Gold with gray leather strap. After a few weeks of wearing, testing and working out with it the MisFit Ray, I definitely am making this one of my Holiday Picks for this year. So sit back and get ya tea or juice ready because this a lengthen blog post. The Ray retails for $99.99 (or $119.99 with the leather strap, as I’ve been wearing it.) It looks like a piece of jewelry but the Ray isn’t just for a cute wrist arm bling. It’s a true fitness tracker as it counts steps, alerts me for sitting too long and even tracks my sleep patterns. Once I initiate Bluetooth to sync the Ray with my phone, all of this data is backed up to the app on my phone in a few seconds. The Ray is powered by three small batteries, which are similar to the kinds in most watches. Since it’s battery operated, this means no extra cords or forgetting to charge, which I like a lot. The batteries have last well over a month and are said to last about six months! As far as setup, I did the unboxing on Inst-stories, and most of my followers got a chance to see me go from box to setup within 5 minutes. As noted before, the MisFit Ray automatically tracks steps, distance, calories, and light and restful sleep. Additionally, it has the option to vibrate for call and text notifications, movement reminders, and alarms. I liked the vibration and notification for sitting down too long a lot. The Ray came in handy while I was at the movie to see a free screening of Moonlight, which you should see the film too. My cousin was running late so I knew she would call once she arrived. Since this was a screening, they were strict on us not having our phones out period. Since I had on my Ray. When she called, I knew because my wrist vibrated 3x with a flashing light indicating someone was calling me. The light didn’t disturb the other movie goers and no one noticed. Winner! My favorite feature is tracking my sleeping patterns. Going without adequate sleep can have both short- and long-term consequences Each day I was able to see a charted view of the total amount of sleep and points where I wake up, toss and turn, etc. This is critical as sleep is vital to our overall well-being but also healthy and fit hair. Wear It & Accessorize Up! The Ray is probably one of the most stylish fitness trackers I have seen. It doesn’t feel like a regular tracker being big and bulky. 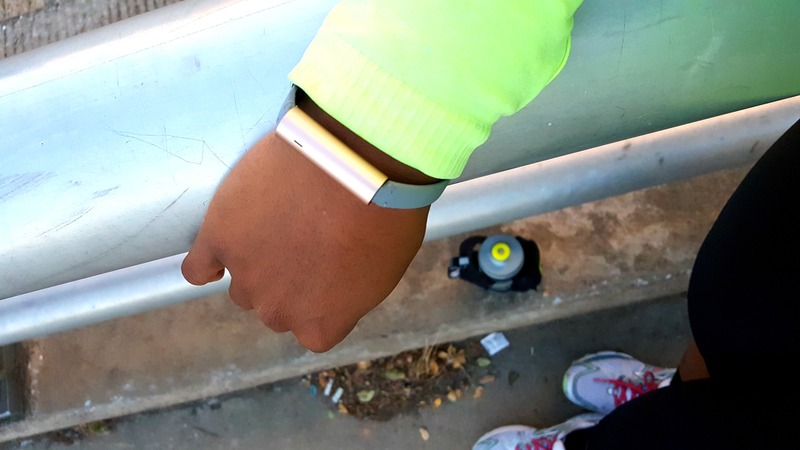 As stylish as the tracker is, it complimented by tons of more fashionable yet useful accessories. MisFit offers a banded bundle, which include three various styles of bands from waterproof to leather. The countless accessories ensure you can switch up your style with your outfit or to meet your daily need. The tools for switching come in the accessory pack, which was very convenient. It took me approximately 10-15 minutes to switch the bands. It wasn’t easy but it wasn’t to hard. It’s a learning curve but next time I can do it quicker. Is MisFit Ray for you? So the big question is if the MisFit Ray for you? The short answer is YES. However, the MisFit Ray may not be for you if you fall into two categories. If all of your friends have a FitBit. Unfortunately, most people have a Fitbit, so the community is pretty active and vigorous (almost like a cult.) This may hinder you from purchasing one as you will be the oddball out. For me, this isn’t an issue and is a positive! If you desire a direct connection to heart rate monitor or extra stuff. Since the Ray is simple and straightforward, there isn’t aren’t tons of advanced GPS and Fitness tracker/watch options. However, the app that powers it is pretty cool as it links to many other health apps such as Google Health, which links to heart rate monitors and other programs. If you are looking for a fitness tracker that doesn’t look like most other fitness trackers, doesn’t break the bank, great quality and doesn’t need to be charged daily then the MisFit has my FitHair Stamp of approval. Since it’s the holidays, I would snag it up on the sales and bundles. Oh yeah, it’s on sale for $69.99 via Amazon so get on it, folks. The folks at MisFit sent me a complimentary MisFit Ray and necklace. I purchased the bundle set on my own. All opinions are honest FitHair Fam.